…Take a “go-to” outfit, put a spin on it by styling it in a different way but still keeping a couple of essential components. I have an addiction…to denim! Publishing my week in outfits for all-to-see has really made me realize just how bad my addiction really is. But, fear not! I am actively trying to break myself of this bad habit, and took this Petite Fashion Challenge as an opportunity to address the problem on the blog. Yes, I know I wear too much denim…I’m working on it! 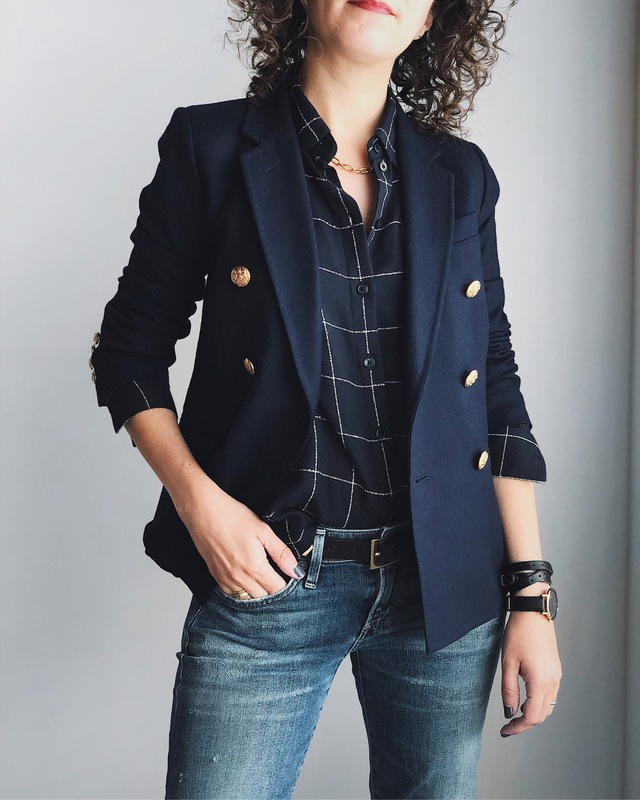 So now that I’ve owned up to my little addiction, for this challenge I took my tried and true “go-to” blazer look that I would normally pair with dark denim, and switched things up with non-jeans! Not the most “springy” of outfits, but it’s June Gloom here in Southern California, so my outfit appropriately matches the dreary weather these days. its so weird to see you in something other than jeans! you pull off this look perfectly, you should definitely wear these cropped pants more! and my need for a vest is getting stronger, lol! There’s nothing wrong with loving denim…especially because that totally works for you! Also, you do the chic menswear look so well. I love how the red piping on your vest inside stands out against your dark colours. Brilliant! I completely agree with Jessy on the piping. I also really like the use of accessories in this outfit. I think the touch of purple from the flower pin is standout while still going well with the other colors. I also like the use of the silver necklace to bring in some light… also because I’m obsessing over that dangley-dainty kinda necklace look lately. How is Disqus working out? Thanks Annie! Disqus is working out quite well so far. I might put up a poll soon to see how others are liking it. Polished as usual! Very lovely!!! You still look polished and casual even without the denim. 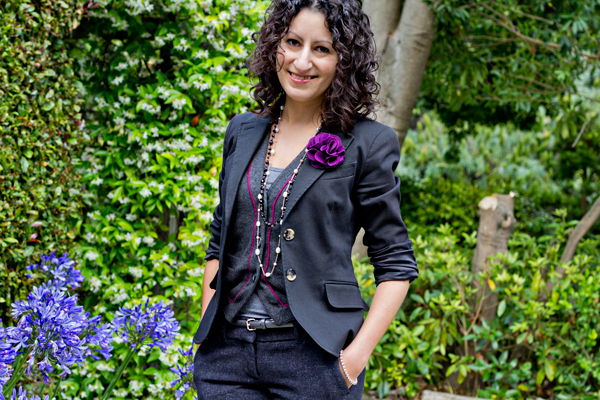 I love your blazers! i adore menswear-inspired style. the vest is especially delightful! I’m glad I’m not the only one trying to kick their denim habit! I’m on the serious hunt for some non-jean pants! You look completely fabulous, lady! I love your take on suiting. I’m totally digging the Men’s Wear vibe of the vest and blazer. The pearls and flower keep the feminine touch. Glad to find another denim person! Although, that’s what you changed up but I still went with it. 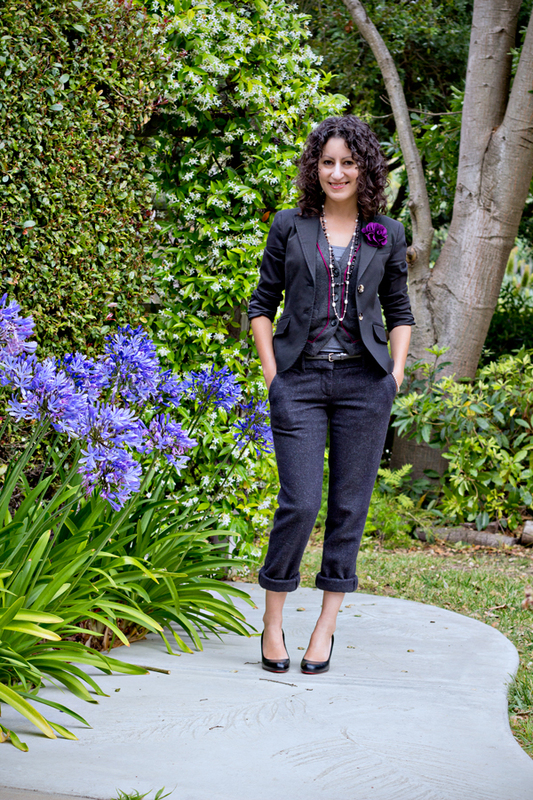 I love these pants, what a great way to change up the blazer and top combo. I really like the flower too. Really love this look! Your trousers are great and the details perfect! It’s also really gloomy here in Seattle so I feel your pain! This is such a great look on you, Kelly. I hope to see you in non-denim pants more often. :) You also pull off the rolled up pants look really well. I’m always afraid to roll up my pants because my legs are so short, but your legs actually look longer! so polished, chic and so Kelly!